Peel the plantain and cut it into thick slices. Heat the oil and fry the plantain slices until golden brown and soft. Remove the slices from the heat and drain on paper towels. Sauté the chicken breast and season to taste. Add the sofrito to the cut chicken and pour the broth over it. Put some butter into a mortar, and add some of the fried plantains. Mix with the pork rinds and garlic. Crush everything together well until a paste forms. Serve the mofongo on a plate and place the sofrito mixture in the middle. To save time, you can use ready-made fried pork rinds sold in bags. They add the necessary crunch to this recipe. Puerto Rico offers a lot more than just athletes, music, and shows. Its recipes are truly amazing, as well. One of Puerto Rico's most well-known recipes is, without a doubt, mofongo. 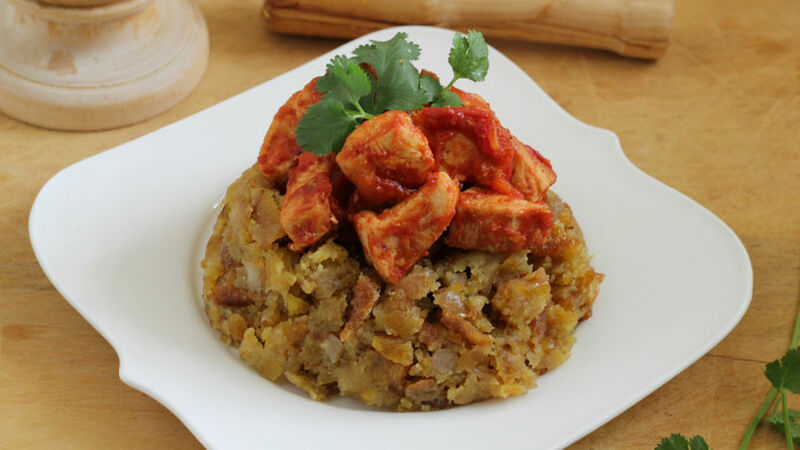 In this recipe, we prepare mofongo with a chicken stuffing and top it off with a delicious creole sauce. The taste of the Caribbean in a single dish. Have you ever tried this gem?